Looking for a hack-proof wallet to protect your smart credit cards? 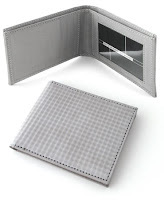 ThinkGeek and Hammacher Schlemmer are carrying stainless steel wallets, made from woven microfibers of stainless steel. According to the Hammacher site, "the tightly woven steel also passively resists radio-frequency hacking--the latest identity theft technique that attempts to scan newer credit cards." Not sure how they will stand up over time, but these would definitely up your geek-cred!